Tribal fishers use a variety of ancient and modern fishing techniques to harvest salmon in the Columbia Basin. Some are designed for the big waters of the Columbia River, while others are customized for the smaller streams and rivers of the upper tributaries. 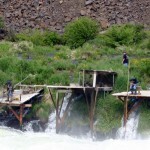 Platform fishing is most common on the larger rivers in the Columbia Basin. These wooden structures, stable despite their precarious appearance, are constructed during low-water periods with engineering techniques that have been handed down for generations. They provide accessible fishing locations to favorable fishing sites. Platform sites belong to individual families, and tribal fishers using these scaffolds are likely fishing in the same location their own ancestors did. Two types of nets are used in platform fishing: Dipnets, fishing nets attached to poles; and hoop nets, nets held open by 6-8 ft. hoops, lowered into the water beneath the platform. Pulling up both nets, when heavy with salmon, takes its toll on the backs of the fishers who use the scaffolds. In the smaller rivers and streams of the Columbia Basin like the Deschutes River pictured here, dipnetting is favored because it allows considerable control. This is important, as the swift currents and rocks are constant threats to fishers and their nets. It takes considerable skill to control the net, attached to a pole sometimes as long as 25 ft. (7.6m). Adding to the difficulty is having to stand in water that can be colder than 60°F (15°C). Historically, hemp twine was used to tie nets, which were then bound to wooden hoops. Pliant green branches were curved into a hoop and secured to a pole with sinew, and the binding was then sealed with pine pitch. The long poles were stripped pine saplings selected for their straightness and length. 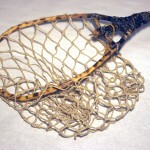 Nets made today have the same overall design, but use modern materials. They are tied with the same knots as ancient nets, but the hemp twine has been replaced with steel-reinforced plastic net wire on steel hoops. Many poles are still made from pine saplings, but it’s not uncommon to see bamboo, aluminum, or even fiberglass poles mounted to the nets. The Columbia Basin’s major waterways have been transformed from giant, free-flowing rivers to a series of long lakes in the past 70 years. With this change of conditions has come a necessary change in the way that tribal fishers catch salmon. 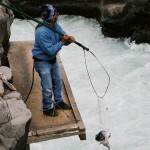 While ancient methods are still used to harvest fish, tribal fishers have adopted other modern techniques that exploit modern realities. Set nets (also called bag nets) are similar to the hoop nets used by platform fishers. They are essentially a large net bag, held open by a hoop. These nets are set out in the river with weights marked with floats. (These floats can be seen year round, as they are left with the weight, not the net.) When salmon swim through the hoop, they are trapped in the net. The fisher leaves the nets out for several hours then pulls them into the boat, along with any salmon that have been caught. 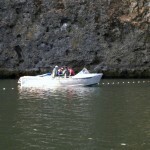 Gillnet fishing involves nets ranging from 200 to 400 ft. (60-120m) long. These nets are strung at strategic locations along the river. Gillnet mesh diameters are chosen to allow the head of a salmon to fit through, but not its body. When a salmon swims into a gillnet, its gills catch on the mesh, snaring it. Fishers then haul in the net, along with the salmon. 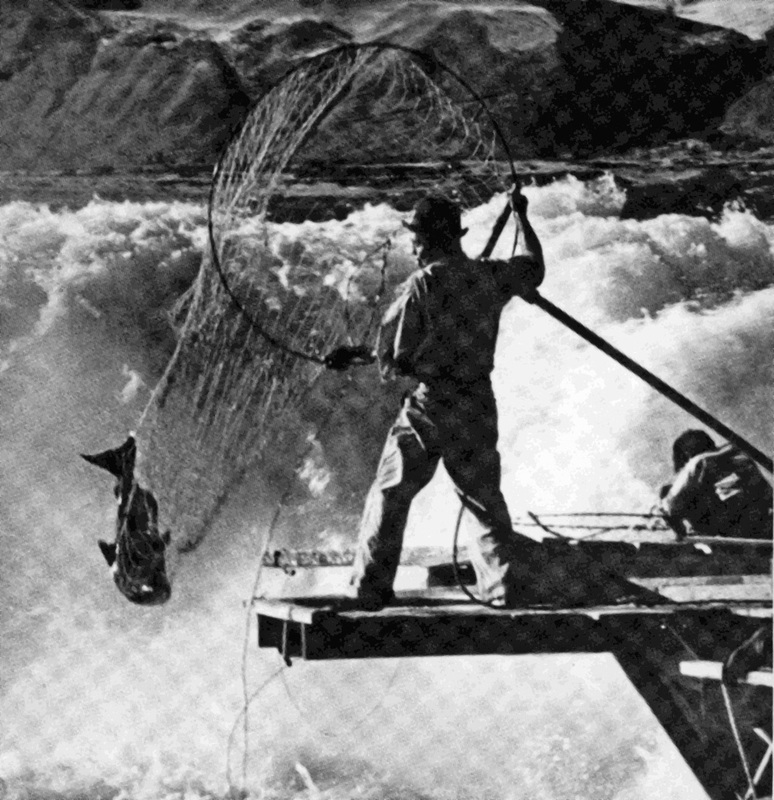 Dipnetting from scaffolds was the preferred fishing technique at Celilo Falls.